Compte rendu publié dans Acta fabula (Février 2018, vol. 19, n°2) : "Dossier : Le Moyen Âge pour laboratoire": Florian Besson, "Comment lire un texte non textuel ?" 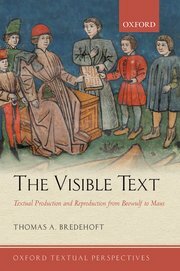 Contrastingly, the late-medieval and print-era periods share a cultural investment in textual reproduction, but they differ both in their characteristic technologies and in how they conceptualize the object of reproduction itself. A final epilogue, briefly considering the nature of electronically-mediated textuality, highlights the importance of understanding the history addressed here, as electonic text both parallels and departs from typographic print in ways that earlier reproductive domains clarify and complicate. Filled with concrete examples of both books and texts, The Visible Text will be of interest to readers in the fields of literature, book history, literary theory, media studies, and visual culture.